If you have a knack for DIYs, if holidays are your cup of tea and fall is right up your alley, you’re the perfect candidate for these easy Thanksgiving table decorations. We’ve kept our list short and sweet, with projects that are bound to win over both adults and kids. Most of our hand-picked suggestions are really inexpensive. But if you feel you don’t want to buy any of the supplies mentioned below, feel free to be creative and substitute some of the materials with something you already have lying around. Want a different take on the Thanksgiving decorations this year? We’ve got you covered if you’re no longer impressed by carved, painted or decorated pumpkins. 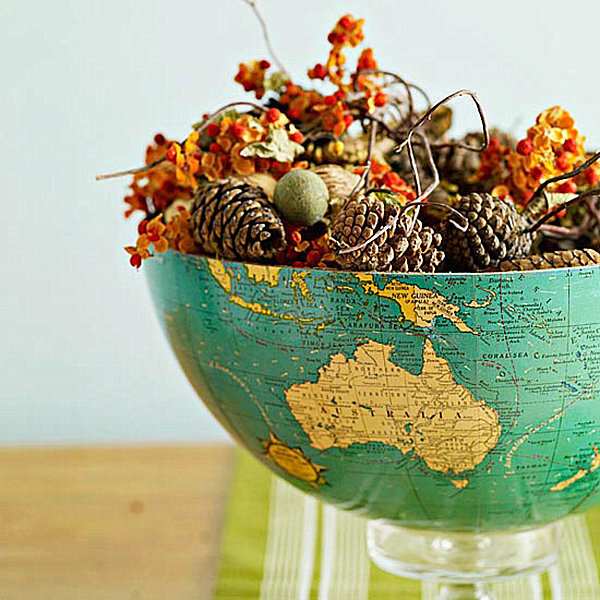 Why not use a globe as a bowl? Mix some natural elements (pine cones, little twigs, dry leaves, acorns, and even dry flowers) with the beautiful globe and you’ll have yourself a one of a kind centerpiece. Simply cut a globe in half and sand paper its edges until they feel smooth. Next up, mix your forest decorations and put them in the improvised bowl. To keep the bowl in place, you can either cut off a small section from the bottom, creating a stand, or use a small glass plate to hold it upright. What better way to keep your guests occupied between courses than creating a message board to encourage them to express their gratitude? After all, that’s what Thanksgiving day is about, isn’t it? The steps for this simple project are easy, and you can even involve your children in the process. You will need a large frame, pins, a pair of scissors, foam and scrapbook paper or old books. You can reuse an old frame that has a vintage touch or buy a new one, especially for this occasion. The core should be soft enough to allow pins to stick to it. We recommend a linen-covered foam that will get the job done and still look good. If you want to get even more creative, pick a fabric of your liking that suits the Thanksgiving theme (think pumpkins, greens, and burgundies) and cover the foam in it to give your old frame a kick. Secure everything at the back with a stapler and then it’s time for the leaves. You can cut them out from old magazines or old books. Keep them in the same size range to avoid a kitschy look, but play around with the colors and try to imitate the natural foliage. Inspired by Martha Stewart, this project looks elegant and it requires a minimum of effort. You’ll only need four supplies to achieve this DIY: dry leaves of your liking (mix and match as you please), simple glass candleholders, spray adhesive, and small candles. The best thing about this project is that it can be used all year round for parties, as center pieces or for a night of pampering. The first step involves applying the spray adhesive to the leaves. Make sure you’re spraying the back of the leaves. You want the front to embellish the glass candleholders, not the other way around. You can then start applying the leaves to the candleholders, allowing the stems to extend a little past the base of the glass. Don’t rush this process if you want the finite product to look amazing. You can interlace your leaves, leave a small gap in between them or cover the entire glass in leaves. When you’re done with the sticking part, cut off the stems and you’re ready to light the first candle. These will create vibrant colors against the pretty foliage. Found on Pinterest, this is one of the most different ideas of how to decorate a pumpkin. It makes for a beautiful dining table centerpiece and it’s easier to make than it looks. Before spray painting the pumpkin with your color of choice (we recommend white, for a striking contrast), make sure the surface is dirt-free so that the paint doesn’t have any problems sticking onto it. Allow the pumpkin to dry accordingly and then the fun part can commence. Choose leaves that vary in shape and size, but stick to three different colors at most to obtain a homogenous piece of Thanksgiving décor. You can glue the leaves straight onto the leaves or you can trace them on tissue paper. The latter is more manageable if you’re involving your kids in this decorating DIY. For sticking the tissue paper, use decoupage glue. To make the paper look like real leaves, push from the outer edges towards the middle to create stems and veins. Top everything off with a thin layer of glue and allow the pumpkin to air dry before adorning your dinner table. Running out of homemade decorative trinkets for your tables? This super easy, cheap idea doubles as a Christmas ornament, so you’re shooting two birds with one stone. To blend in the acorns with the Thanksgiving vibe, choose orange or burgundy felt. For this project you’ll need some acorn caps, wool roving, thread, dishwashing soap, glue and a drill. You can begin with half a handful of wool, separating the fibers and rolling them back to form a loose mass of wool. To make the ball of wool more manageable, dunk it into a bowl of soapy water. This is where your shaping techniques should kick in. Roll the ball between your palms and start shaping it into an acorn. Practice makes perfect, so don’t be discouraged if you don’t see the magic happening in the first five seconds. You might need to dunk the wool ball a couple more times and you’ll notice the fiber becomes denser as you keep rolling them. When the wool looks like you want it, rinse it in water, squeeze out the excess water and reshape it. Allow it to dry on paper towels for at least half a day. If you want to hang the felt acorns, you’ll want to make two tiny holes in the acorn caps and pull some gold thread through them. Once the felt acorns are dry, add a dot of hot glue inside the acorn cap and fit the ball in it. Voila! 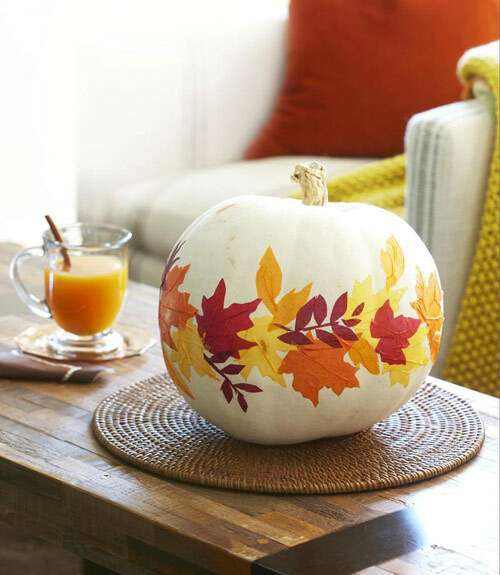 You’re a crafts master now and you can ace these easy DIY Thanksgiving table decorations.